The World Boxing Association (WBA) has notified WBA cruiserweight world champion Beibut Shumenov and WBA Interim cruiserweight title-holder Yunier Dorticos, as well as their representatives, that Caribe Promotions has lost its rights to promote the WBA mandated Shumenov vs. Dorticos title fight. Dorticos’ promoter, Caribe Promotions, originally won the Shumenov vs. Dorticos title fight rights last November with a winning purse bid of $350,001, which required a fight date within 90 days. Although rumored to be held in mid-February in either Miami or Las Vegas, Caribe’s ability and willingness to actually promote the fight came into question in January, 2017. The WBA demanded that Caribe confirm its intentions and even granted Caribe additional time to respond, but Caribe failed to file confirmation of a fight date with the WBA. Because Caribe was unable to confirm its intentions, the WBA had little choice but to award rights to the second-highest purse bidder, Tom Brown’s TGB Promotions. Caribe Promotions has been forced to also forfeit its $35,000 purse bid deposit with 10-percent off the top going to the WBA and remainder ($31,500) distributed to Shumenov and Dorticos, respectively, on a 75-25 percent basis due to its failure to promote the fight. Shumenov (17-2, 11 KOs), fighting out of Las Vegas by way of Kazakhstan, fought last May 21, when he stopped 15-1-1 Junior Wright in the 10th round of their Las Vegas fight for the vacant WBA World cruiserweight title. The WBA had ruled that the Shumenov-Wright winner would be the mandatory challenger for its “Super” champion, Lebedev, within 90 days, however, it later allowed unified cruiserweight titlist Lebedev (against Shumenov’s strong objections) to fight his International Boxing Federation (IBF) mandatory defense against challenger Murat Gassiev, effectively mandating an eliminator between Shumenov and Dorticos with that winner to fight the winner of Lebedev-Gassiev. Only days prior to the Lebedev-Gassiev title fight, Lebedev was inexplicably allowed to fight Gassiev without defending his WBA title, as only his IBF belt was on the line. Gassiev (24-0) defeated Lebedev (29-3) by way of a 12-round split decision in Moscow to become the IBF cruiserweight world champion and Lebedev remains the WBA Super cruiserweight world champion, at least for now. The WBA is expected to rule on Shumenov’s objections to Lebedev’s fight against Gassiev, Lebedev’s status and whether Lebedev will remain champion having lost his last fight. Dorticos has made false claims in the media that Shumenov, who had been waiting for the WBA to rule on his petitions to force Lebedev to fight him without further delay, had been avoiding him. It is ironic now that Dorticos’ own promoter first sought to delay and has now defaulted on the long-awaited confrontation by failing to promote the Shumenov-Dorticos title fight within the WBA deadline. 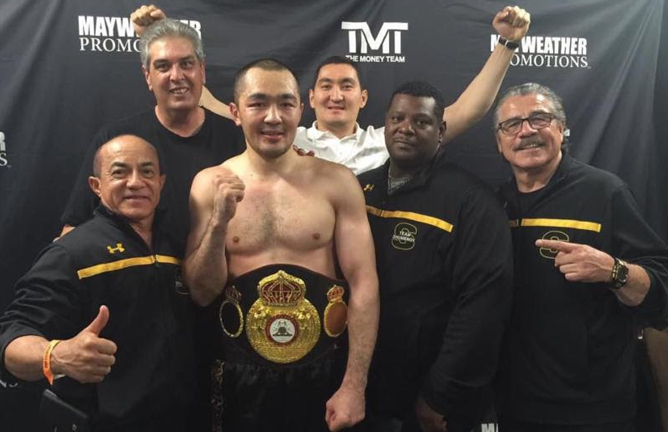 A former WBA Super light heavyweight world champion, the 33-year-old Shumenov is the first two-division world champion from a Soviet-bloc country.